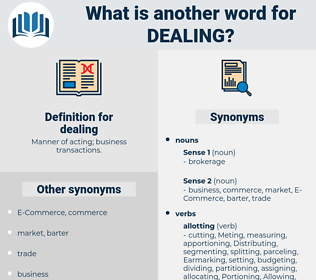 What is another word for dealing? 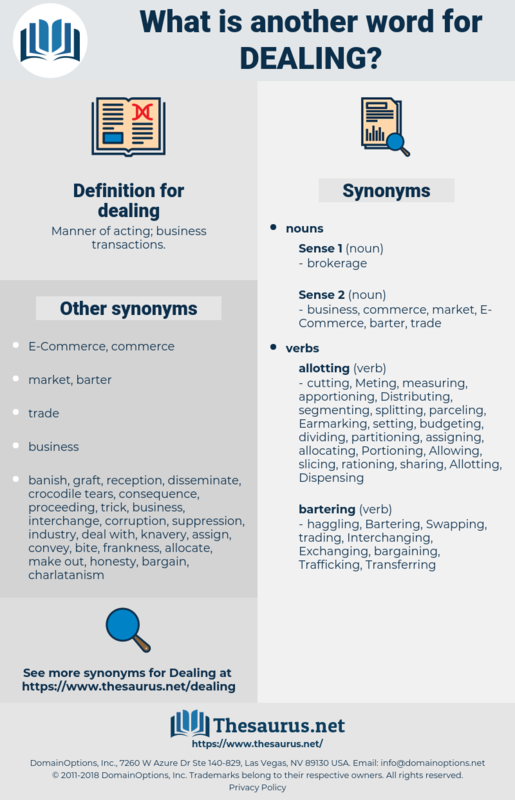 Manner of acting; business transactions. settlements, issues, Securities, Bourses, transactions, transaction. reports, Rights, discuss, Negotiating, negotiation, Negotiations, relationship, relationships, tackling, transaction, dealer. L, Declaring, communications, appealing, leading, Deleting, accommodating, Responding, according, solving, evaluating, Delivering, special, Administering, Manipulating, judicial, investigating, defending, assimilating, collaborating, troubleshooting, Adjudicating, ordering, Rehabilitating, resolving, defusing, analysing, Explaining, approximately, grappling, Examining, Defeating, Dialing, Dialling, behandeling, Indicating, Apprehending, Dedicating, calculating, solutions, determining, Eradicating, leaving, regional, confronting, treaty, Deploying, Considering, Eliminating, departing, detailing, Exploring, Describing, applications, relates, Analyzing, specialized, specializing, Contemplating, deciding, participating, Deterring, Withstanding, loading, attending, catering, representing, Mitigating, documentation, contending, relatively, depicting, Overcoming, resolution, Guaranteeing, corresponding, Concentrating, Counteracting, regulating, Incorporating, responsible, Assessing, Devoting, challenging, Regulations, specialising, pending, Measures, Elaborating, Afflicting, mastering, intervening, Remedying, encompassing, reflecting, bestrijding, existing, enabling, heading, answering, Advocating, interpreting, safeguarding, haggling, reacting, Originating, Including, proceeding, marketing, Stipulating, redressing, communicating, gambling, arranging, Adhering, coordinating, interacting, particular, Circumventing, endeavouring, lodging, procedure, understanding, distinguishing, Arising, Avoiding, saving, Prosecuting, implementing, assuming, Cooperating, intervention, Promulgating, Channelling, Amending, dispose, Disposing, communication, Correcting, averting, moving, Discussing, mandating, mandates, case, cases, juggling, Manufacturing, satisfying, Utilizing, Involving, advancing, liable, engaging, Displaying, helping, Constituting, regulation, issuing, Replying, documenting, documents, Battling, Areas, Rectifying, judging, defining, accepting, resulting, debate, Debating, reprocessing, Envisaged, gathering, Harnessing, affecting, experience, Experiencing, Repairing, wrestling, holding, dosing, organising, Embodying, le, Comprising, stopping, recording, rule, ruling, Removing, report, reports, betrekking, Charging, happening, tampering, waiting, performing, acquiring, standing, guiding, underlying, work, working, embracing, lessening, measurement, following, identifying, rendering, absorbing, protecting, Practising, verwerking, inputting, Containing, accompanying, belonging, Proposing, broadcasting, Encountering, drafting, Preparing, Exchanging, Preventing, looking, being, contributing, terrorism, Instituting, Mentioning, welcoming, Capturing, striking, leaning, interesting, curing, home, collecting, wrangling, living, feeling, Suppressing, Reversing, Prescribing, Fulfilling, targeting, ending, speaking, reference, referencing, upholding, using, composing, prevention, causing, Abusing, Attempting, pursuing, Maintaining, wearing, part, Employing, auctioning, Enshrining, browsing, project, Establishing, halting, filling, Affirming, Outlining, Assisting, striving, competing, sending, ranging, servicing, repeating, Combating, combatting, arguing, Resisting, Achieving, showing, Noting, suffering, Enhancing, reducing, completing, Enacting, writing, Referring, refers, Bridging, laying, Obstructing, struggling, fixing, Intending, Organizing, easing, spending, cracking, actioning, complying, Transforming, coming, follow-up, sweetening, exceeding, Encumbering, Impacting, study, studying, watching, Harboring, \, taking, takes, featuring, contacting, falling, caring, Applying, Consisting, Stating, Occupying, paying, exercising, attacking, touch, touching, bending, ensuring, reviewing, remaining, opposing, Carrying, commissioning, Converting, launching, Aiming, steering, Expressing, sitting, improving, framework, Adopting, talking, training, raising, campaigning, Prohibiting, Specifying, becoming, testing, monitor, questioning, questions, serving, Handing, directing, fighting, ec, owing, Introducing, driving, functioning, Earning, Producing, Receiving, fostering, rising, passing, voting, hearing, starting, increasing, saying, Stamping, view, viewing, banning, Promoting, dumping, Purporting, opinion, Requiring, Occurring, Witnessing, seizing, calling, searching, Stemming, listing, borrowing, imposing, Having, tracking, shooting, finding, problem, Granting, acting, Claiming, hitting, theory, Lifting, focusing, seeking, Attaching, link, party, punishing, drawing, limiting, Hosting, curbing, know, knowing, body, seeing, flowing, entering, setting, Obtaining, iv, trying, meaning, meeting, office, Spanning, Gaining, pushing, asking, keeping, run, turning, shopping, thinking, presence, Forming, boarding, 2007, reaching, wishing, putting, counting, bring, bringing, going, mounting, Doing, six, issues, making, getting, Negotiations, relationships, tackling, trading. Alleviating, compromising, countering, offering, approaching, Negotiating. We begin by dealing briefly with the argument from observation. Good faith on the part of railroad companies requires of them fair and honest dealing with the people. data link, dwelling house, dilleniaceae, dolmas, detailing, dullness, dealings, deadliness, delonix, dalliance, dawdling, dwelling, dead language, daylong, doweling.